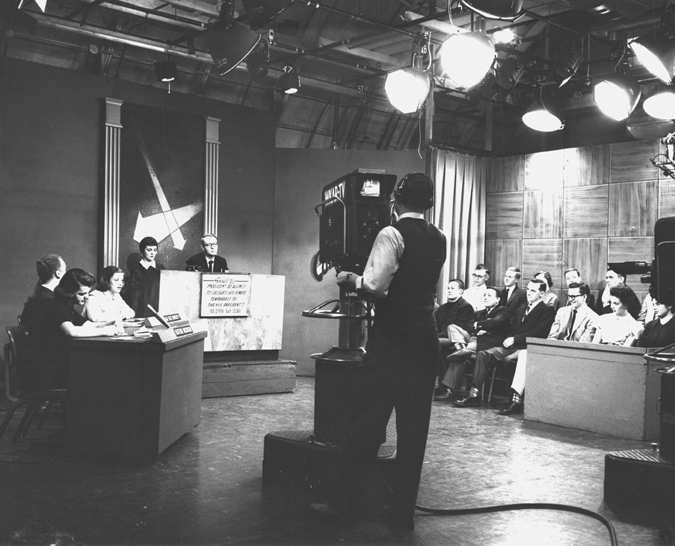 Students of MSU and Eastern Michigan University have a live debate on WKAR-TV, a practice which originated on the radio program as early as 1923. 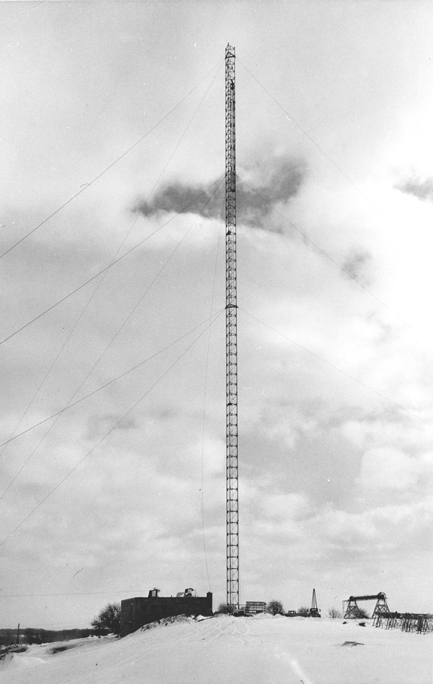 This photograph shows the new WMSB-TV station tower in Onondaga, Michigan in 1959. WKAR’s progress stalled for a period following its immediate success. They covered their first football game—M.A.C. vs. Central—in 1924 as well as instituting a program of bedtime stories for children in 1925, but interest waned in the organization until a new face came to MSU in the year of 1934: Robert Coleman. Before moving to Michigan, Coleman had worked at Ohio State University’s radio station, and upon his arrival he made it his mission to revitalize the WKAR program. He moved the station to improved facilities in the Auditorium, began reporting on football again, and expanded both the staff and the broadcasting hours. With the help of both Shaw and Hannah, a separate radio department was created in 1940, and WKAR regularly broadcasted crop reports, weather forecasts, concerts, political speeches, athletic events, and lectures. The face of WKAR also evolved shortly after this revitalization with the onset of World War II. Still under the direction of Robert Coleman, the station, “…wrote to both the Michigan governor’s office and the Michigan Defense Council offering WKAR’s services. The offers were accepted.” For the duration of the war, radio programs included speeches by President Roosevelt, Winston Churchill, and Madame Chiang Kai-shek, as well as government dramas such as You Can’t do Business with Hitler. Coleman also had various MSU professors on the program to lecture about war issues from their specific fields’ perspective, while still balancing all of these new WKAR additions with sports coverage and classical music. 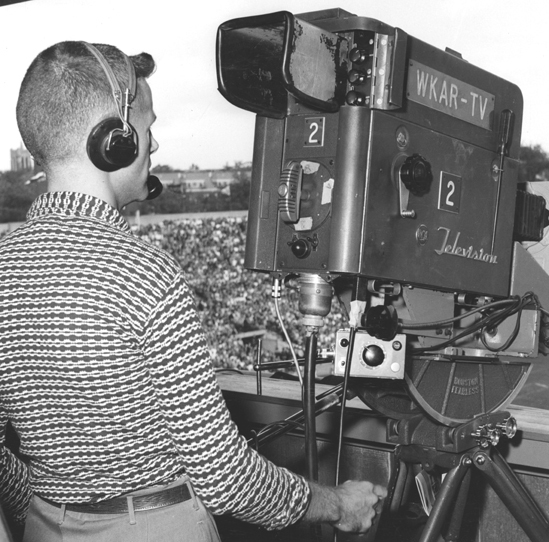 Shown here is a student filming an MSU football game for WMSB-TV in April, 1959.
television program east of the Mississippi River, and under the direction of Armand L. Hunter they covered campus social events as well as local and state-wide news. Unfortunately, the innovative system was so advanced at this time as to be inaccessible to most viewers, and the next year they merged to create a public channel under the heading of WMSB. WKAR Public Media continues to provide MSU students and other listeners with updates on social events, the political on-goings of Michigan, and musical programs, being more active than ever today. For more information about their organization, visit their website. It all started with the State of Michigan buying a farm. A college was built on its back forty acres. On February 12, 1855 Michigan Governor Kinsley S. Bingham signed into law an act for the establishment of a state agricultural school. Two years later at the dedication ceremony on May 31, 1857, 61 students were to begin their higher education at the Agricultural College of the State of Michigan. However, establishing this university was no walk in the park. Ever since the establishment of the college there was a dispute about whether or not it was to be a separate institution or a part of the University of Michigan. The government finally declared the college to be a separate institution. Other issues also took place over the years. The college suffered financially and almost closed down numerous times. Its financial issues were resolved and the University grew into what it is today, a home for more than 42,000 students and a place where a great education is earned. Tomorrow we celebrate Founders Day at Michigan State University, and every student should thank Governor Bingham for signing that act into a law. I know I will! The date February 12 has special significance in the history of Michigan State University. It was on February 12, 1855 that Michigan Governor Kinsley S. Bingham singed into law the legislation that established the Agricultural College of the State of Michigan. It would take another two years before the school officially opened its doors to students on May 13, 1857. The establishment of an agricultural school did not happen overnight. Throughout the 1840s and 1850s farmers and others in the state clamored for an agricultural school. Progress was made at the state constitutional convention that rewrote the Michigan Constitution in 1850. It was put into law the desire to establish an agricultural school, however it did not specify whether it would be an independent institution or if it would be a part of the University of Michigan. The battle during the next four years was fierce to determine where the agricultural college would be placed. I think all students, alumni, faculty and staff of Michigan State University are glad that the government of Michigan finally decided that a separate institution would be the best solution for the agricultural college. The rest, as they say, is history. For more information about the early years of Michigan State University you can consult Michigan Agricultural College: The Evolution of a Land Grant Philosophy, 1855-1925 by Keith R. Widder.